هذه قائمة بأسماء مدن ولاية كنتاكي في الولايات المتحدة والتي بلغ عددها 425. A^ All but two of Kentucky's county seats are cities. The exceptions are Whitley City (مقاطعة مككريري) and بورلينغتون [لغات أخرى] (مقاطعة بوون). 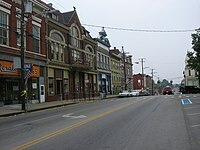 Two Kentucky counties have dual seats of government: the seats of مقاطعة كامببيل are الإسكندرية and نيوبورت and the seats of مقاطعة كينتون are إندبندنس and كوفينغتون. B^ Unless otherwise noted, population and area are given according to the تعداد الولايات المتحدة 2010. C^ Dates are those of the most recent formal incorporation, according to the records of the كنتاكي's Land Office. D^ For municipalities located in more than one county, the primary county (according to the إحصاء سكان الولايات المتحدة) is listed first. دانفيل, home of سنتر كوليج [لغات أخرى]. هازارد, the inspiration for the دوقات هازارد. ^ Commonwealth of Kentucky. Office of the Secretary of State. Land Office. "122 County Seats". Accessed 15 Jul 2013. نسخة محفوظة 04 مارس 2016 على موقع واي باك مشين. ↑ أ ب ت Established 1833. ↑ أ ب ت Established 1834. ↑ أ ب Established 1799. ↑ أ ب ت ث ج Established 1812. ↑ أ ب Originally inc. 1854. ^ Originally inc. as باردستاون (كنتاكي). ^ Originally inc. as بارلو (كنتاكي). ^ Originally est. as بيتيفيل (كنتاكي). ^ Established 1816. Originally inc. 1850. ^ Originally inc. as بيري (كنتاكي). Renamed بيري (كنتاكي) in 1869. ^ Originally inc. as ميدلتاون (كنتاكي). ↑ أ ب Originally inc. 1880. ^ Originally inc. as بولينغ غرين (كنتاكي). 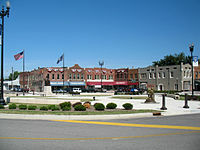 City of Bowling Green. "History of Bowling Green: Beginnings". Accessed 22 Jul 2013. نسخة محفوظة 15 أغسطس 2014 على موقع واي باك مشين. ↑ أ ب Established 1835. ^ Originally inc. as بريمن (كنتاكي). ↑ أ ب Originally inc. 1828. ^ Originally inc. as كالهون (كنتاكي). ^ Previously incorporated 1871 and 1946. ↑ أ ب ت Established 1840. 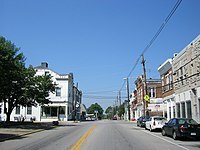 ^ كامبيلسبورغ (كنتاكي) separately inc. 1876; it later grew to include Old Campbellsburg, while taking the shorter name. ↑ أ ب ت ث ج ح Established 1817. ↑ أ ب ت ث Established 1818. ^ Originally est. as Port William. ↑ أ ب Established 1794. ^ Originally inc. as سنترتاون (كنتاكي). ^ Originally inc. as سنتر سيتي (كنتاكي). ^ Established in 1873. Originally inc. 1880. ^ Rennick (1988) lists Clay as having been reïncorporated in 1872. ^ Also known as كول رن فيليج (كنتاكي). ↑ أ ب ت ث Established 1820. ↑ أ ب ت ث ج Established 1793. ^ Originally inc. as داوسون سبرينغز (كنتاكي). ^ Originally the separate cities of دايتون (كنتاكي) and جيمستاون (كنتاكي). ^ Jamestown incorporated 1848; Brooklyn inc. 1849. ↑ أ ب ت ث Established 1836. ^ إدجوود (كنتاكي) incorporated 1962; إدجوود (كنتاكي) inc. 1965; both annexed by Edgewood 1968. ↑ أ ب ت ث Established 1797. ^ Also known as يوبانك (كنتاكي). ↑ أ ب ت Established 1830. ^ فورت ميتشل (كنتاكي) separately incorporated 1927; annexed in 1967. ^ Originally inc. as Lebanon, then جورجتاون (كنتاكي). ^ Kentucky Encyclopedia, p. 371. "Georgetown". University Press of Kentucky (Lexington), 1992. Accessed 26 Jul 2013. The Kentucky Land Office cannot provide a date for Georgetown's incorporation. نسخة محفوظة 03 يناير 2015 على موقع واي باك مشين. ^ Rennick, Robert. Kentucky Place Names, p. 115. "Germantown". University Press of Kentucky (Lexington), 1987. Accessed 26 Jul 2013. نسخة محفوظة 14 فبراير 2017 على موقع واي باك مشين. ^ غريمور ديفونديل (كنتاكي) originally inc. 1959. غريمور ديفونديل (كنتاكي) originally inc. 1958. ^ Originally inc. as غرينأب (كنتاكي). ^ Originally inc. as Mt. Pleasant. ^ Originally inc. as هيريتاغ كريك (كنتاكي). ^ Originally inc. as هايلاند هايتس (كنتاكي). ^ Established & originally inc. 1867. ^ Originally incorporated 1941; إنديان هيلز (كنتاكي) separately inc. 1955. The City of Indian Hills website claims they were merged in 1999, but the Commonwealth of Kentucky's Land Office continues to list Indian Hills-Cherokee Section as an active municipality. نسخة محفوظة 13 سبتمبر 2017 على موقع واي باك مشين. ^ Originally inc. as Eden. ^ Originally inc. in 1888. ^ Actual date unknown, but a 1938 court ruling claimed incorporation of at least 30 years. ^ Established 1839. Originally inc. 1845. ^ As of the تعداد الولايات المتحدة 2000, per the Kentucky Land Office. نسخة محفوظة 07 نوفمبر 2017 على موقع واي باك مشين. ^ Originally est. as لورنس (كنتاكي). ^ This figure is for the Louisville/Jefferson County metro government (balance), those areas either unincorporated or within the City of Louisville proper before the 2003 merger of the urban and county governments. The population of the entire metro area was 741,096. ^ Annexed the cities of Keeneland and Whipps Millgate in 2001. ^ Originally est. as غرينفيل (كنتاكي). ^ Originally inc. in 1842. ↑ أ ب Established 1824. ↑ أ ب Originally inc. 1833. ↑ أ ب ت ث ج Actual date unknown. ^ Established 1847. Originally inc. 1874. ↑ أ ب ت Established 1792. ^ Originally est. as مونت فيرنون (توضيح). ^ Originally inc. as نورتونفيل (كنتاكي). ^ Originally est. as Hopewell. ^ Established 1789. Originally inc. 1839. ^ Originally est. as بايكسفيل (كنتاكي) and inc. as بايكسفيل (كنتاكي). ^ Originally est. as بريستونزبورغ (كنتاكي). ^ Originally inc. as ريسلاند (كنتاكي). ^ Although city claims 1951 incorporation. ^ Originally est. as Riverview. ^ Earlier establishment legalized by General Assembly in 1816. ^ Originally inc. 1871 in Gallatin Co.
^ Established 1850. Originally inc. 1872 as ساندي هوك (كنتاكي). City gov't reäctivated 1930 & 1968. ↑ أ ب Established 1825. ^ Originally inc. as سلاوتيرز (كنتاكي). ^ Merged with ستراثمور فيليج (كنتاكي) 1991. ^ تايلور ميل (كنتاكي) separately incorporated 1953; annexed in 1959. تايلور ميل (كنتاكي) separately inc. 1929; annexed in 1972. ↑ أ ب Established 1819. ↑ أ ب Originally inc. 1840. ^ Originally inc. as Fredericksburg. ^ Established بحدود 1797. Originally inc. 1838. ^ University of Kentucky. Kentucky Atlas & Gazetteer, "Wilmore". Accessed 8 Jul 2013. The Kentucky Land Office cannot provide a date for Wilmore's incorporation. نسخة محفوظة 15 ديسمبر 2012 على موقع واي باك مشين. ^ City gov't reäctivated 1986. ^ Commonwealth of Kentucky. Office of the Secretary of State. Land Office. "425 Active Kentucky Cities" & individual pages. Accessed 15 Jul 2013. نسخة محفوظة 04 مارس 2016 على موقع واي باك مشين. آخر تعديل لهذه الصفحة كان يوم 19 ديسمبر 2018، الساعة 15:40.